I just saw this event posted online and thought I would share. What a cool idea! (which, by the way, resulted in this), I decided to take a casual stroll down the tile aisle. And BAM! These glass beauties were staring me right in the face. So was their price tag- $4.99 a square foot! True, that doesn’t even touch the price of traditional white subway tiles ($2 a square foot- or on sale, $1 a square foot- ouch) but since I’d only seen these glass ones for around $15 a square foot, I was pretty stoked. I bought a sheet, just to take it home and make sure I liked it. What was I thinking- of course I liked it! I liked it this much! So later that night when we were making an emergency HD run (I realized that using a rough roller can give your walls that bumpy look that makes them look like they belong in a locker room), we raided the tile aisle again. At first I thought there were only 4 but then we discovered there was an entire secret stash behind the first box. Jackpot! Around a hundred dollars later I had 20 shiny glass sheets in my possession. 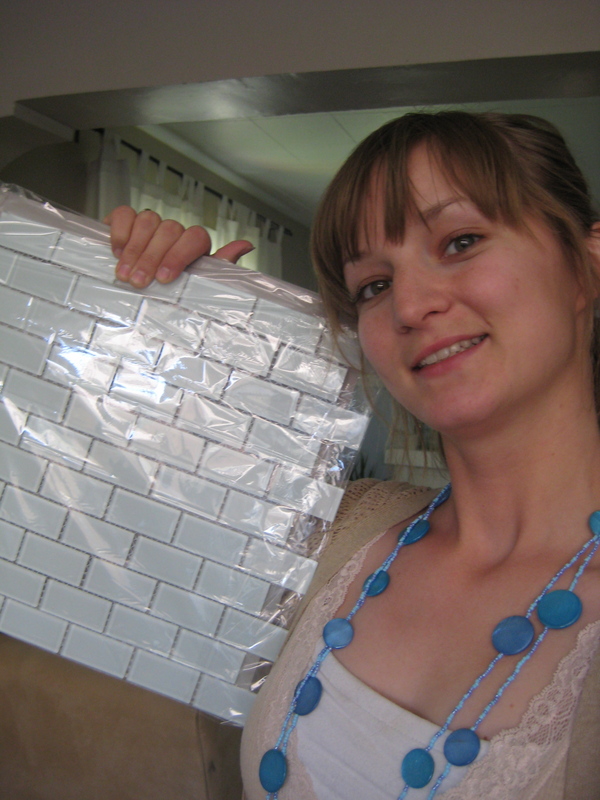 Since my good friend Kristin just bought a townhome that needs just a touch of TLC, she was interested in learning the tricks of the tile trade. She came over and helped me on Friday night, and the two of us busted out the south wall (sink side). As I said before, Woot! 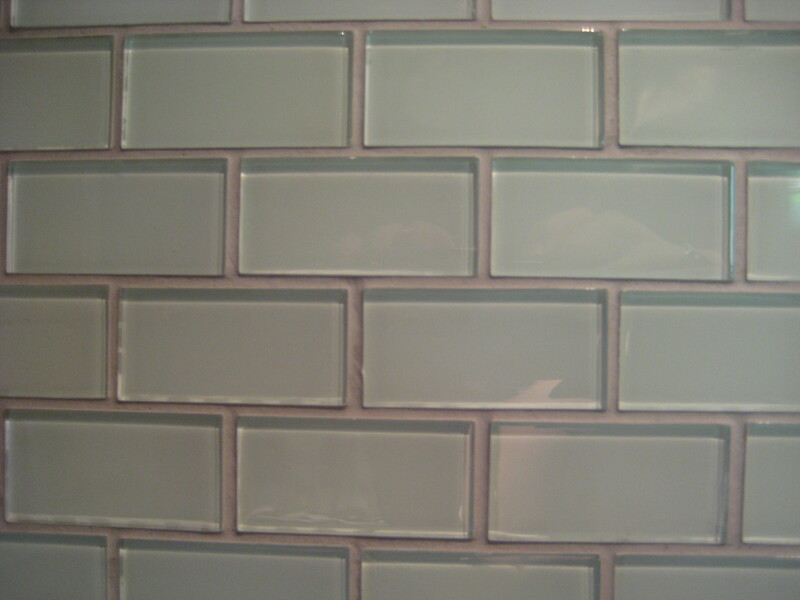 By the way, not to be a Negative Nancy, but I forgot how much I hate tiling. The cutting, the mess, the obsessive straightening and re-straightening… Working with glass was different, too. 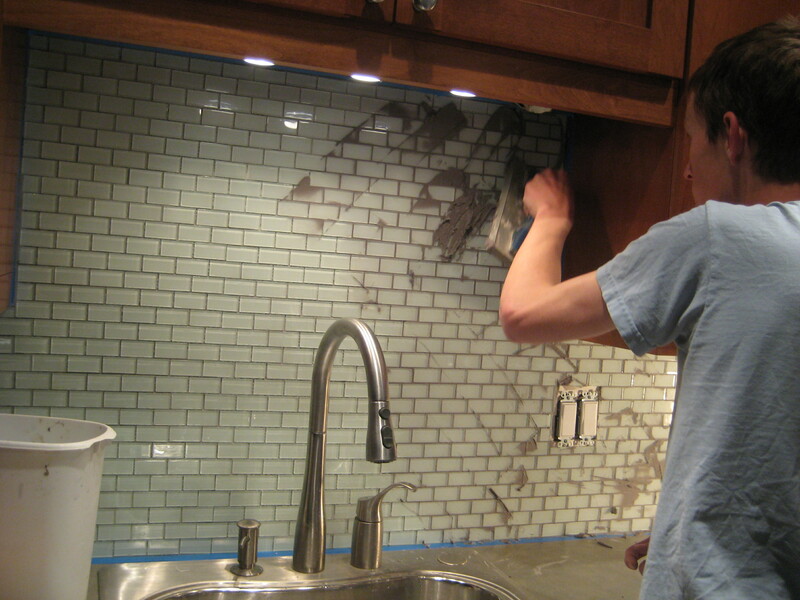 In some ways I liked it better than ceramic or porcelain- it’s so smooth and easy to clean grout off of, but it also chips easily and sometimes those glass chips end up embedded in my hand and stay there until I notice them later while sitting in the car after eating Costco pizza. You win some, you lose some. Even though my stove has a high back, I tiled down to the level of the counter tops. Who knows- one day I might own one of those sleek stoves with no back. You may notice the piece of wood that I screwed to the wall so the tiles wouldn’t slip right after I put them up. 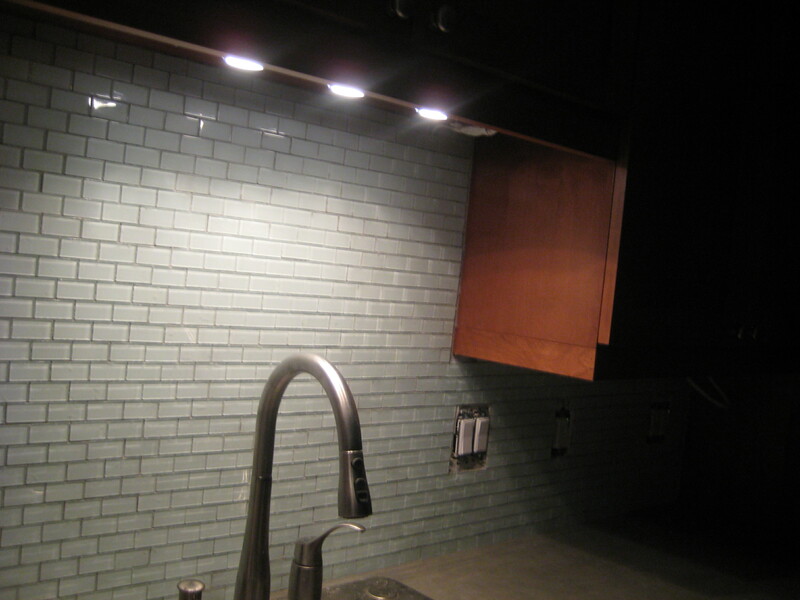 Here is an action shot of the sink side mid-grout (the left hand side isn’t done yet). And here it is done! Not bad for DIY! 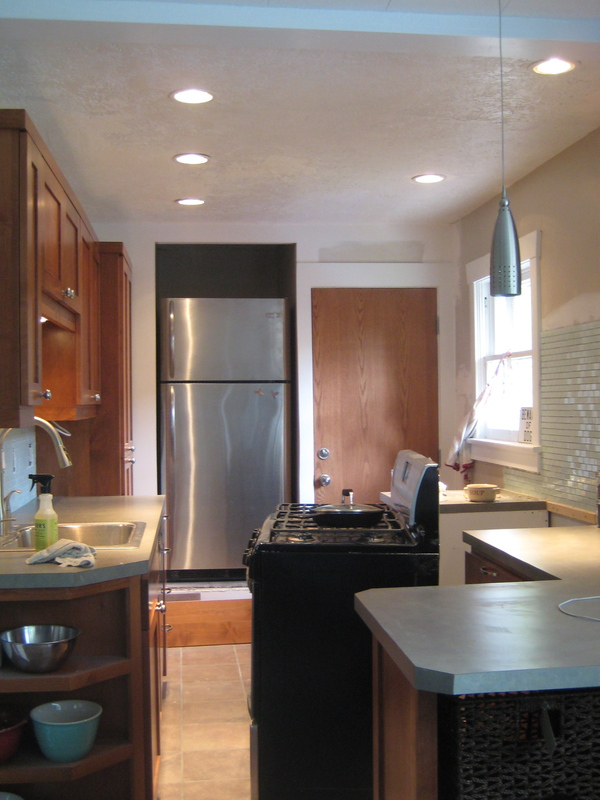 The edges around the cabinets will have to be fixed, maybe with a scrap of matching wood. The outlets and switches will also need a little bit of finagling, as the wall is now deeper. Time for a close up- I love the shadows. They give depth. 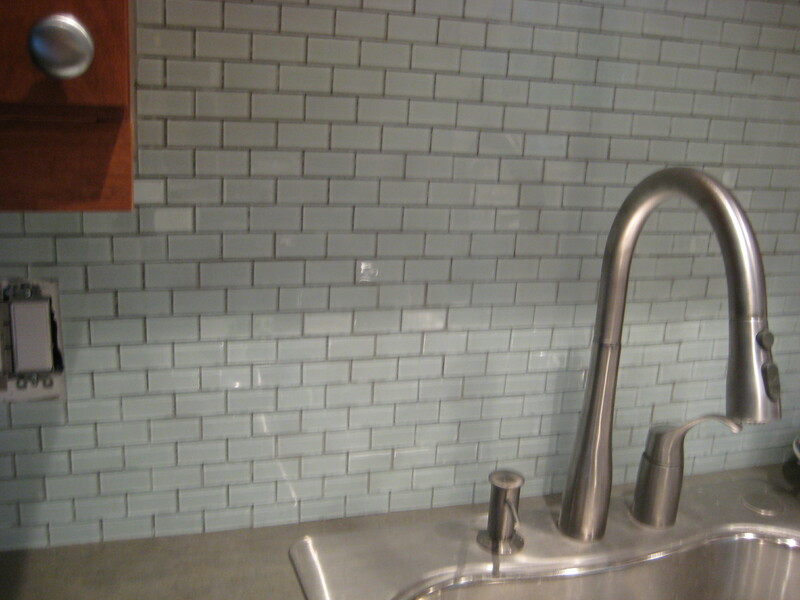 I know I said I was going with white subway tiles (which I happen to love) but I just couldn’t pass up the glass at such a great price, and I wasn’t totally in love with the white in my particular kitchen. I’ve said it a million times and I’ll say it again- I’m not a designer and I don’t think I’m particularly good at designing, so my style is just to kind of pick things I like and hope they somehow all tie together when it’s all said and done. 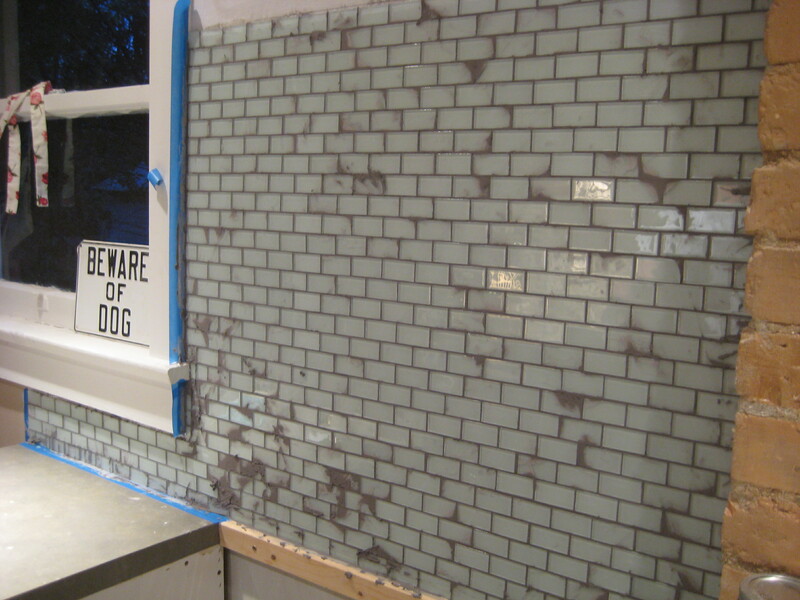 There are a few more finishing touches for the kitchen, so we’ll see if I can accomplish that! For now, I absolutely cannot wait to make a tomato-based sauce and just splatter to my heart’s content. Or mix up a cake batter and lift the mixer out ever so slightly so that cake batter flies all over the place. 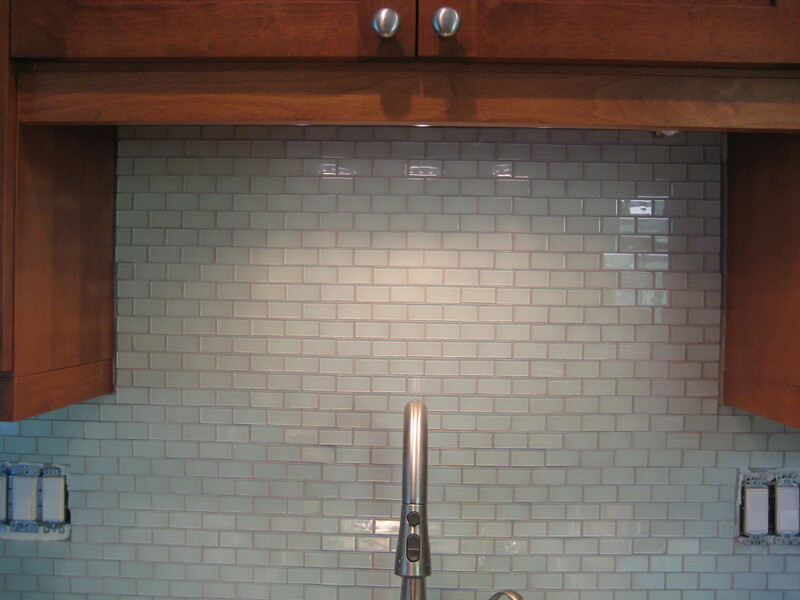 This backsplash will be a pleasure to clean! K this is NOT the after post- sorry guys. I really wanted it to be. But you know when you think “Just a couple more things and I’ll be totally finished!” and it really means “Oh my gosh how could I possibly take a picture when the _________ looks like that! No way- I’ll just spend 5 minutes (read: another hour or so) fixing it.” And by that time, you’ve made a mess of the place all over again, and you’ve lost your nice daylight, and it’s time to go have all-you-can-eat pizza… You know how that goes, right? 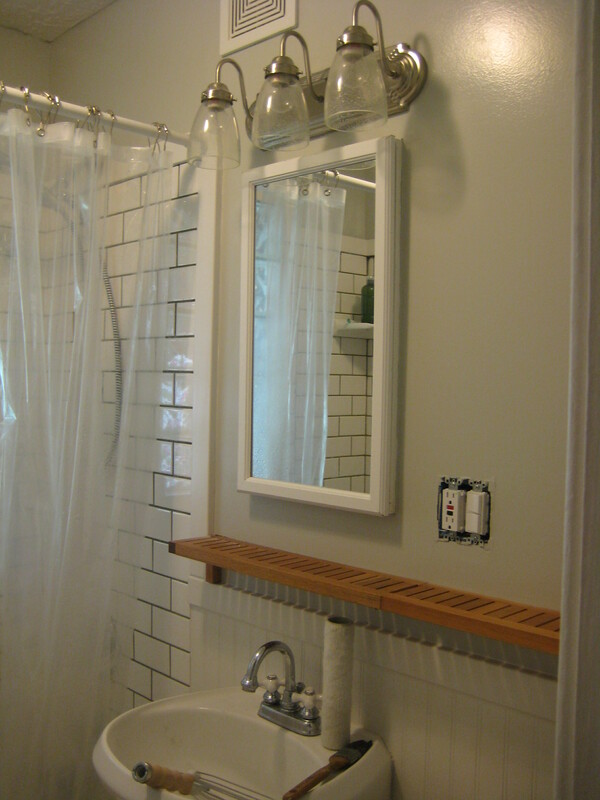 Well anyway, I actually did make progress on the bathroom this weekend, and I’ve got the pics to prove it. It all started with the sudden realization that I did not have to live forever with white drywall mud smeared on my ebony walls, and there was no reason that I couldn’t march down to Home Cheapo right this second for an afternoon lunch break and buy some paint. The first time I picked the paint color, I did it online. I know. Who does that?!?! 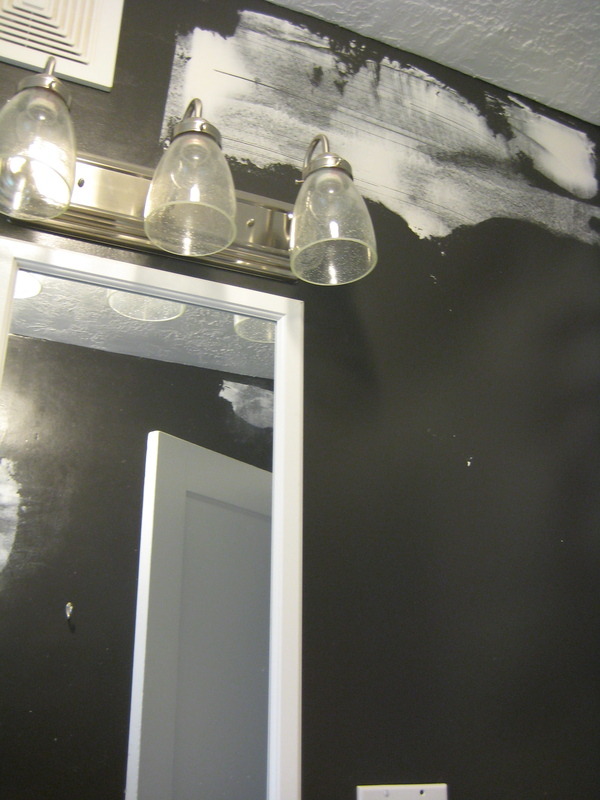 I chose Obsidian Glass by ICI, and when I saw the paint in person I freaked a little. It wasn’t gray. It was black. Like a black marker that was just starting to run out of ink. But actually, I kinda liked it. Even though the bathroom is so small that you could use all 3 major fixtures (sink, toilet, tub) at once if you really wanted to, I thought the Obsidian Glass balanced all the white nicely and added some drama. Jonny kept coming over to my house saying “These walls look like crap! <name of his employee who painted it> didn’t even patch these cracks. 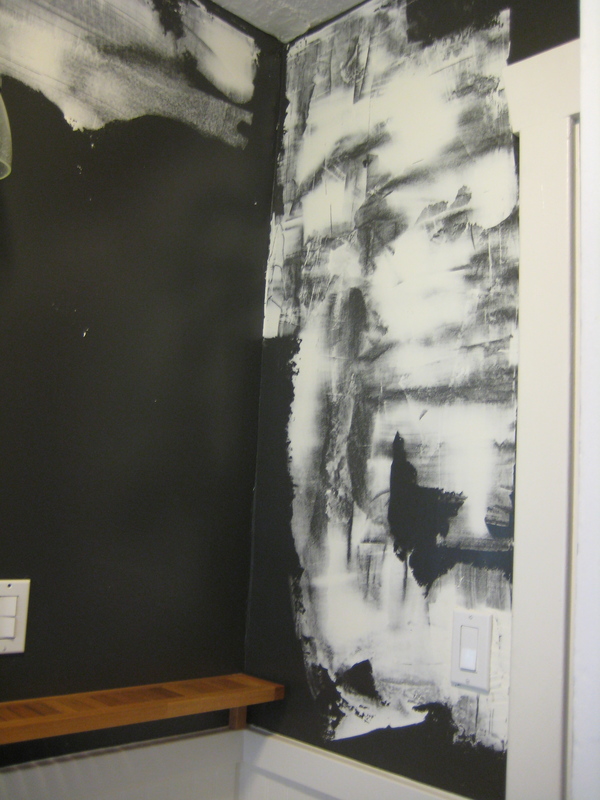 What a bone head.” And true, the old plaster walls have their share of cracks and other imperfections. So one day, he came over and couldn’t stand it anymore and got out the ol’ mud and putty knife and went to town. I wish I had a picture of what they looked like after that. Just picture what a black asphalt parking lot might look like after a wedding cake fight- that’s the general idea. Oh but that’s not the disaster. After weeks of leaving the mud on the walls (weeks!) I finally decided that I was going to sand down the mud and paint it once and for all. I went down to the basement to get the extra Obsidian Glass, and it was nowhere to be found. Drat. Are you kidding me? I called Jonny. Thoughts on the new color? What do my friends and I do on a Friday night? You’re lookin’ at it! A night of hitting the hottest clubs- er, tile saws. Thanks a million Kristin! I’ll post a better pic when I’m not half asleep. I know that probably about 96% of my readers follow Young House Love and saw their toilet post yesterday, but I just had to share it for the other 4%. Did you know that you can buy a little $20 kit to convert your toilet into a dual flusher? Neither did I! I thought I’d have to just wait until I needed a new toilet to get one of the water-saving dual flushing ones. And have no fear if you don’t fancy yourself a handyman or handywoman- the installation is tool-free, and according to John, only takes about 20 minutes. The one they bought is here. And for anyone out there using cloth diapers, their post also includes another little bonus that will probably make your life a lot easier. They are a very thorough bunch and explain things very well, so if you’re even remotely interesting in greening your john, head on over and check them out. I think it’s pretty cool that someone figured out how to convert existing toilets, rather than encouraging everyone to toss theirs in a landfill to buy a new one. Yay toilets! 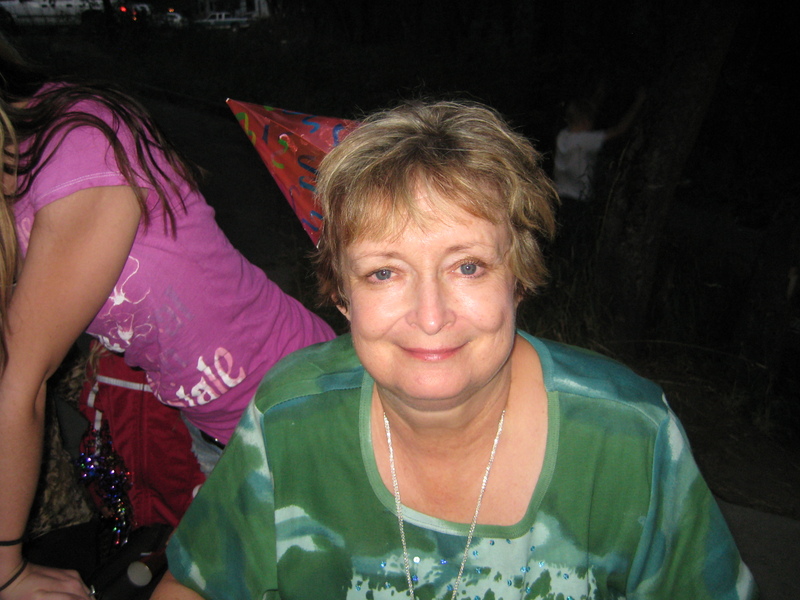 This is my late Mothers Day post. But since I’m a good daughter 365 days per year (heh) I think that May 19 is just as good a day as any for this. This year, I decided to be on the ball* and crafty. *On the ball for me means that my crafty gift reaches the recipient within a week of the holiday for which it was made. I found this adorable template on How About Orange (originally from here), and I had to have it. I’m a fan of homemade cards but I’m not a fan of putting them in security envelopes which is all I have, so therefore I am a fan of card/envelope combinations. If card/envelope combinations were on facebook, I would “become a fan”. 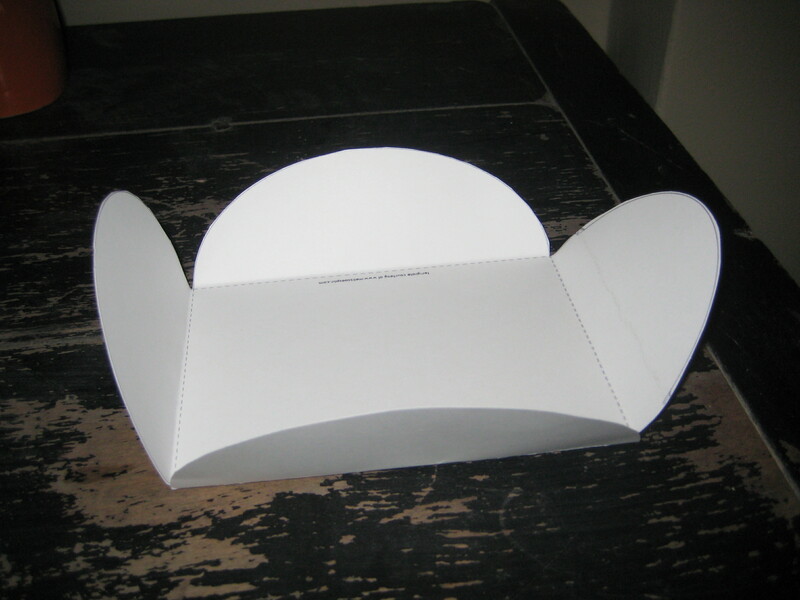 It’s a super easy template, and you can even print the invitation or the note version if you wish. I used the blank one. I printed it on cardstock, and I should have enlisted some of Kristin’s first graders to help me cut, as apparently my cutting skills have become a little rusty. It’s a good thing my mother always told me it’s the thought that counts. After I cut out the template, I sewed a simple stitch around the curved parts, and a fabric heart on the front. 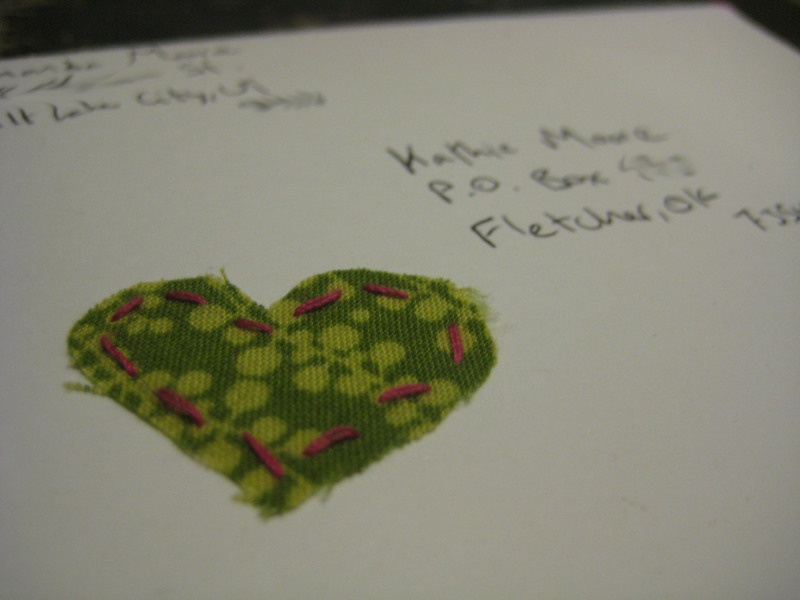 I then stamped and addressed it, and patted myself on the back for sending something by mail all by myself, three whole days before Mothers Day. 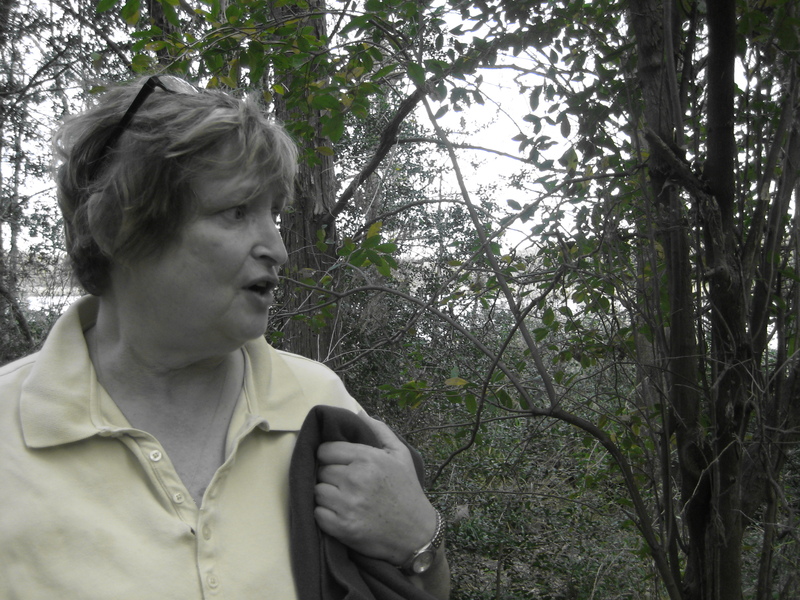 Now I don’t expect that my mom will read this (try as she might to keep up on my blog, my mother has an aversion to computers unless it has to do with Sudoku, bless her heart), but I just feel the overwhelming need to share my love for my mother with a buncha strangers on the internet. Seriously, she’s the best. 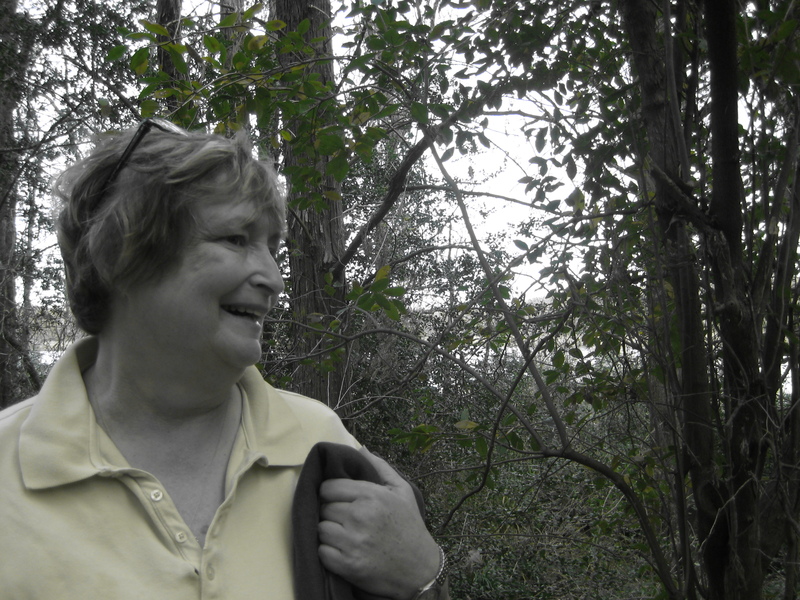 When I think of love, I think of her. I know she feels bad because she was a working mom by the time I came along (the last of 4) and I didn’t get as many home-cooked meals as the other kids, but mama, that just made your homemade chicken noodle soup that much better. Even when we’d eat it for a week straight because you made enough to feed the entire armed forces. My mom is one of those that can quiet a crying baby in seconds. She can convince a 4 year-old that wearing clean underpants is fun, should they need such convincing. She can also convince a bratty teenager that she’s loved and special, and that’s no small feat. And sometimes when the bratty now-adult is having a really bad day, she’ll call mom and say “Can I just come live with you in Fletcher and do crafts and cook food and go swimming every day?” And though my mom knows that’s pretty unlikely, she will always laugh and says yes, which is exactly what the bratty now-adult needs to hear at that moment. I could go on but I’ll stop. Right after I say that she’s not perfect, but I feel so blessed that I somehow ended up with her as my mom. And wow, I didn’t mean for this to be a mom tribute post, but it looks like that’s what it’s turned into. Just a couple more things about this rockin’ lady. She’s always concerned for the general welfare of those around her. I just love this woman. Happy May 19th Mothers Day!